Oklahoma Connection | Hancock was born in Hobart, Oklahoma. Hancock has climbed Washington's Mt. Rainier and has ridden a bicycle across the United States twice. A Hobart, Oklahoma, native, Bill Hancock has achieved a unique trifecta at the highest echelon of intercollegiate athletics. He was the first full-time director of the NCAA Final Four, the first director of the Bowl Championship Series (BCS), and the first executive director of the College Football Playoff. After graduating in three and a half years from the University of Oklahoma with a degree in journalism, Hancock served as assistant sports information director for the Sooners before returning home to operate the family newspaper with his brother. He then became assistant commissioner for the Big Eight Conference office before joining the NCAA in 1989. 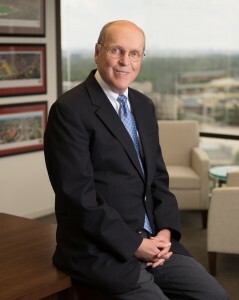 Hancock has served on the U.S. Olympic Committee staff at 11 Olympic Games and two Pan American games. Hancock is also an accomplished and published author, with two books to his credit. His memoir about his 36-day bicycle journey from Huntington Beach, California, to Tybee Island, Georgia, Riding with the Blue Moth, is his story of overcoming grief and self-reflection. Riding with the Blue Moth was among the top sports books following its release in October, 2005, and was re-issued in 2015. His second book, This One Day in Hobart, is a history of his home town. Hancock is married to his high school sweetheart, the former Nicki Perry. They have two sons, Nate Hancock and the late Will Hancock. Will died in the Oklahoma State University basketball team’s airplane crash in 2001. Bill and Nicki have three grandchildren. See pictures of Bill Hancock and other media HERE.